It’s this amazing woman’s 80th birthday today. 80’s never looked so good! My heart and head could never put into words how overwhelmed and humbled I am to be her granddaughter. It’s a tangible sign the undeserved favor of God has graciously been upon my life since I was chilling in utero. Of all the families I could have been dropped into, I’m so thankful he picked this one. My Granny is not rich in dollars and she doesn’t have an overwhelming amount of things to show for her lifetime of hard work, but what she does have is something that doesn’t translate into bank accounts on this side of heaven. She is a very rich woman. A blessed assurance that she is loved and saved by Jesus. A holy, deep, unrelenting faith that He is all sufficient. A driving passion that no matter her age or circumstance, she is still called to lead, gather, love and disciple. A servant’s heart to always an active part of God’s house. She is a kingdom builder. A peace that calms the soul and a joy that reminds you His joy isn’t rooted in circumstance, but time spent in His presence. I just love this woman. To other’s she has been so many things – an employee, a fellow widow, worship leader, singer/entertainer, speaker, counselor, a pastor, a discipler, and a spiritual mom to name a few. 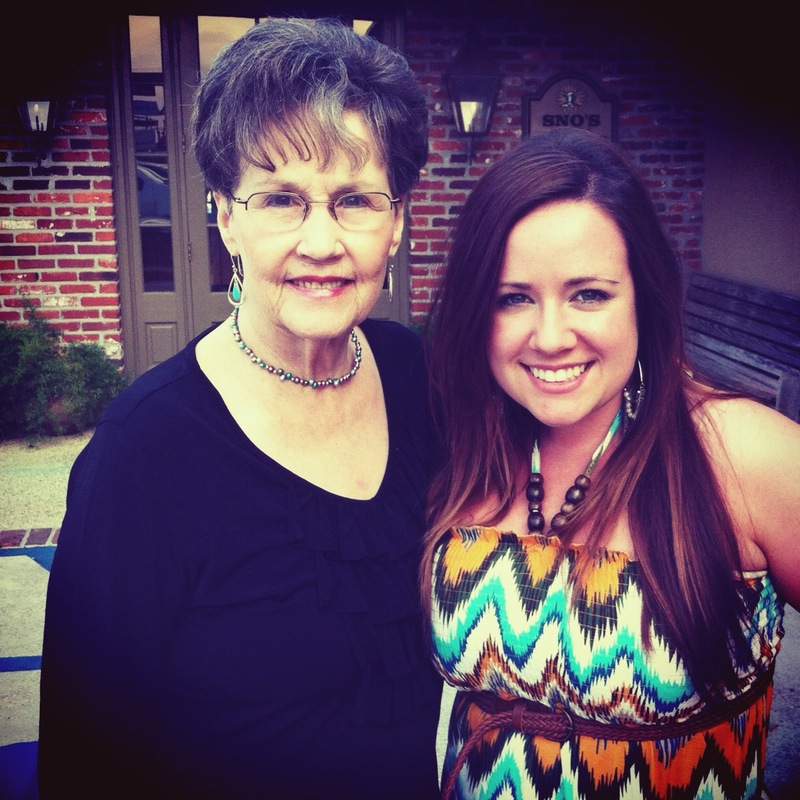 To me though, she is my Granny, my childhood singing partner and the one who without flinching placed a microphone in my hand time and time again, my personal prayer intercessor, a life counselor, a cheerleader, a birthday pen pal, my favorite birthday voicemail, a role model and the women’s pastor I’ll always esteem above all others. My most treasured memory with her is the few weeks right after my grandfather passed away. I stayed with her for two weeks, so she wouldn’t be alone. They married when she was in her teens and after 50+ years with her love, she didn’t know what life was without him.We did all the weird things you have to do when someone passes away together. We ran one million errands. We cried. We talked about a man we both loved and cherished. We sang songs. We tried to imagine how the holidays would look now. Would we survive? We watched 5,340 episodes of the Gather’s on TBN. She sang along, I laughed. She has every one of their DVD’s and she made sure I got to watch them all. We looked at all the things she’s purchased from QVC (which is more than the number of Gather DVD’s she owns). We tried on her clothes, all 745,325,864 jackets and shirts and jewelry. We read old journeys. We looks at songs our Papaw had written. We listened to our family albums. We sang their song, “No Ground” no less than 20 times and harmonized flawlessly. We held hands. We cried some more. A few years later she had this crazy eye surgery to correct a hole in her retina and she had to lay flat on her stomach for two weeks. If you know Johnny Mae, you know that’s not going to happen without someone making her lay back down, sit back down, and fussing at her to stop moving. My job was to get this stubborn woman to obey her doctor’s orders. If you know me, you know this is also not going to happen. For two weeks we did our best to subdue our stubborn selves and keep ourselves entertained. Somehow we both survived. We had a lot of time to talk though. I asked her big life questions this time. What was it like being in ministry so many years ago? What was her favorite ministry season? What was the hardest thing they went through. Was marriage hard? What does it mean to be a good wife? How the heck do you find a husband? How did she handle when tragedy strikes….again. What’s her take on affairs, divorce, marriage, family, money….you know the fun things. How do you know you’re doing what you’re suppose to? What’s your take on passion..and changing the world? If she had any other advice, what would it be? Good news is when you’re laying face down for two weeks and bored out of your mind, you’ll answer any question your granddaughter ask you. I treasure her words, advice and mostly, her heart. She is so kind, loving, pure…..yet she’s feisty and a fighter. I just love that picture that as a woman who has both tasted and seen the faithfulness of God he has refined her heart to a place that it both oozes grace and love, but is unshaken by things of this world that do not line up with God’s word or promises. She isn’t interested in being politically correct, I don’t even think she knows what that is. She is honest and speaks truth without hesitation, but because her life oozes grace even if that truth stings it’s somehow easy to hear. I want to be like her. Jesus never fails. Not once, not almost once. Jesus is never late and often not so early. I’m so proud to be her legacy. Her testimony and past isn’t filled with garbage, sin, and wild parties. It’s simple. It’s pure. It’s solid. It’s faithful. She met Jesus. She loved him all her days. And to say Jesus has used her in 80 years to change the world would be an understatement. When your love of Jesus all the days of your life is an automatic response of your understanding of HOW MUCH he loves you, you too will know he will take care of you in every season and in every way. Even the seasons when you’re in your 70’s, your husband passes away and you have to start all over again. He’s good at helping us start over. I sure hope when I’m 80, I’ll see my past filled with the same gems that fill hers. I hope I’ll turn around and be a mother to thousands like her. I hope I’ll see church plants like her. I hope people will speak of me the way they do of her. I hope people iwll matter to me they way to do to her. I hope I see Jesus how she does. I hope I hear him as clearly as she does. I hope I pray like her. And, oh sweet Jesus, I hope when I’m 80 my face doesn’t have wrinkles either. Granny, you have shaped so much of my heart and taught me a lifetime of lessons about knowing how much Jesus loves me, loving others, and serving in the church. I don’t think I’ll ever know how to put words to how humbled and honored I am to walk in your shadow. Thank you for your faithfulness to the Lord. Thank you for honoring him. I’m not so naive that I don’t know I walk in a difference kind of favor and blessing because of the choices you made. Thank you for considering me in your choices decades ago. I love you bigger than all the superdomes in all the world. 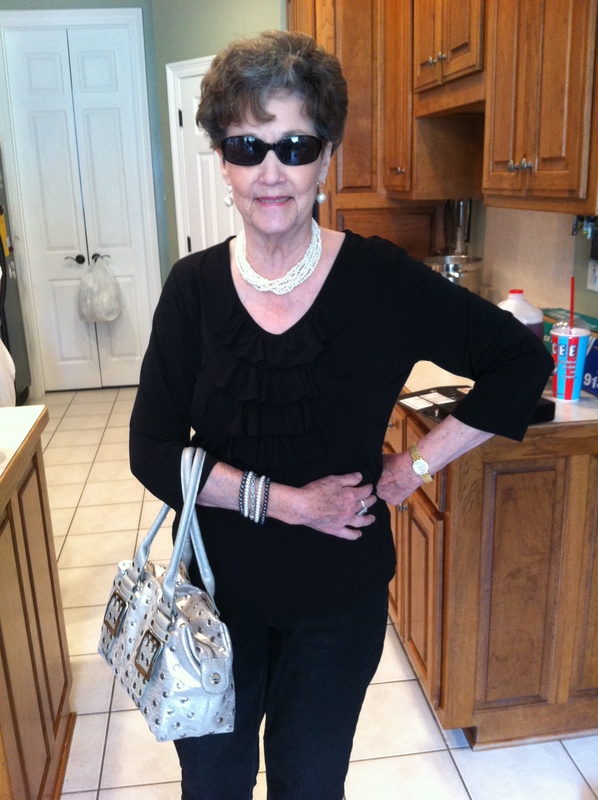 Happy 80th Beautiful Woman!